Ministry of Foreign Affairs of Turkmenistan has held a meeting with the Secretary General of the Chamber of Commerce and Industry of the Economic Cooperation Organization (ECO) Adem Kula, the ministry said in a statement Aug. 18. The sides exchanged views on the prospects of partnership. The secretary general delivered a proposal on a briefing in Istanbul dedicated to the ongoing Turkmenistan-Afghanistan-Pakistan-India (TAPI) gas pipeline project, as well as laying the Turkmenistan-Afghanistan-Pakistan (TAP) power transmission line. He noted that such an event will cause the interest of other ECO member states, the message says. Construction of the Turkmen section of the Turkmenistan-Afghanistan-Pakistan-India gas pipeline was launched in December 2015, while the Afghan section - in February 2018. Being the leader of the international consortium TAPI Pipeline Company Limited, Turkmengas with a controlling stake performs the functions of the main financier and manager of the project. The consortium also includes the Afghan Gas Corporation, Pakistan’s Inter State Gas Systems (Private) Limited Company and India’s GAIL. The total length of the pipeline with a capacity of 33 billion cubic meters of gas per year will be 1,840 kilometers. 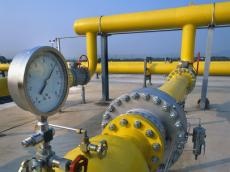 TAPI will export gas from the Galkynysh field in Turkmenistan, which is the second largest in the world. Economic Cooperation Organization, ECO, is an interstate economic organization formed in 1985 with the participation of Turkey, Iran and Pakistan. Since 1992, ECO activities have intensified with the accession of Afghanistan, Azerbaijan, Kazakhstan, Kyrgyzstan, Tajikistan and Uzbekistan. The purpose of this institution is to discuss ways to improve development and promotion of trade and investment opportunities.